VANCOUVER, BRITISH COLUMBIA--(Marketwire - April 23, 2012) - Handeni Gold Inc. (the "Company" or "Handeni Gold") (OTCBB:HNDI) is pleased to announce the final first phase drill results on its Kwandege project which is located on its 800 km2 Handeni property in the United Republic of Tanzania (Fig. 1). "The assay results on Kwandege are very encouraging, particularly the continuous background of gold that is present throughout most of this target", said Dr. Reyno Scheepers, President and CEO of Handeni Gold. "We have now upgraded the Kwandege target to project status, which is located some 17 kilometers away from the original Magambazi Hill mineralization, illustrating that our other already identified targets all may have similar potential", he added. 37 drill holes (4989 meters in total) have now been drilled on the Kwandege mineralized zone (Fig. 1), completing the first phase drilling program on this project. Of the 19 holes for which assay results are reported here, 15 were drilled on the main Kwandege target, three on a chargeability and radiometric target south of the main Kwandege target and one on a potential south eastern extension of the main Kwandege target (Fig. 1). The total number of drill holes on the main Kwandege target for the first phase drilling phase were 33, including a single hole abandoned due to bad drilling ground. 26 of the 32 drill holes yielded gold assay values of more than 0.5 g/t over a one-metre interval or thicker intersection, whereas four of the remaining holes had anomalous gold values of up to 0.49 g/t. As shown in Table 1 belowthe best results for the currently released data is 6.20 g/t over 5 m, including 29.60 g/t over 1 m (KW2_07), 2,11 g/t over 1 m (KW1_07, and KW4_03) and 3,70 g/t over 1 m (KW2_08). Table 1: Assay results for the 15 drill holes on the main Kwandege targets zone reported. Of the three drill holes reported here and drilled on the chargeability zone (KW3_01, KW3_02 and KW3_03) (Fig. 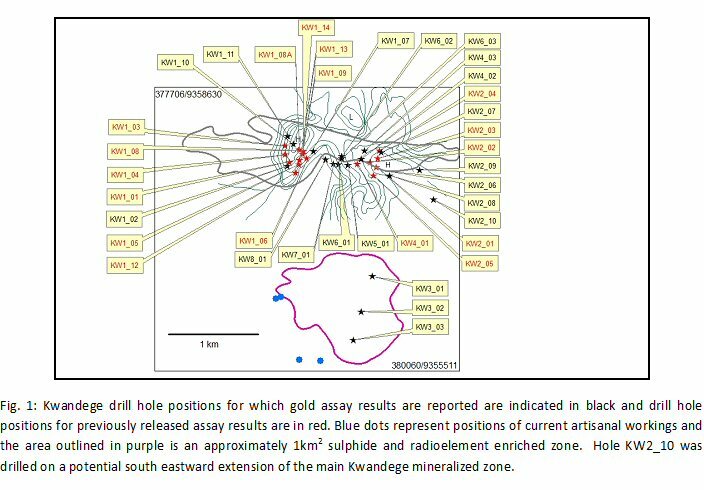 1), all three intersected the zone associated with gold mineralization in the Handeni area but only KW3_01 yielded anomalous gold values of 0.24 g/t over 1 m intersections. Thus, despite large percentages of pyrite, as well as some arsenopyrite being present in most of the core intersected on the chargeability anomaly as outlined, general gold values over this anomaly are unexpectedly low. The potential for gold on the perimeter of the chargeability zone however remains high and further drilling is required. Anomalous gold values were intercepted over large portions of drill core in KW2_10, drilled on a potential south eastern extension of the main Kwandege mineralization zone. Although no values of economic grade are present in this single drill hole, the garnet amphibolite (the favourable zone for gold mineralization) was intersected. The lower values are most likely due to an unfavourable sub-surface structural intersection and further drilling is necessary to assess the (new) south eastern extension of the main Kwandege target. KW2_08 with 3.70 g/t over 1 m.
An important feature of the Kwandege target is the fact that low level gold values (0.5 g/t to 1 g/t) were encountered in numerous intersections in the drill holes and also confirmed by the latest assay results. As indicated in Fig. 1, anomalous gold with some potentially economic intersections have been encountered in an E - W (strike) direction of 1,501 meters (based on the results of the completed phase 1 drilling program). The additional assay results as reported herein confirm the open ended nature of the mineralization in an E-W direction. The structural control on the gold mineralization is an important feature of mineralization at Kwandege. Based on the current results, gold is particularly enriched in the upper of two garnet amphibolite layers separated by a felsic gneiss unit. Within the garnet amphibolite, gold is most likely concentrated in the proximity of fold noses. The package of garnet amphibolite as well as felsic gneiss units are contained within a SSW towards NNE thrust unit. Handeni Gold is currently evaluating the geological results of the first phase drilling program and planning the second phase of drilling on the Kwandege prospect which will consist of a program of infilling drilling as well drilling aimed at extending the western extension as a priority followed by the eastern extension of the mineralization zone. The drilling, sampling and quality assurance/quality control programs are overseen by a team consisting of Reyno Scheepers Pr. Sci. Nat.;Ph.D. (CEO and a Qualified Person as designated by NI43-101), Bernard McDonald M.Sc. (Expl. Geol. ; VP Exploration) and George Rwekiti (M.Sc. ; Exploration Manager). SRK Consulting is externally monitoring the program. Drill hole results are reported as received and in no preselected order. Intercepts are reported as drilling widths due to extreme folding of layers. More drilling will be needed to confirm true widths that are estimated to be approximately 80% at Kwandege. For the holes reported for this phase of the assay program sampling was conducted along one meter continuous intervals of the core. Splitting of samples (core saw) is conducted on site for each project and all samples submitted with QA and QC checks (approximately in the following variable sequence): Standard, 9 Samples, Blank, 1 Sample, Duplicate, 7 Samples, Standard. External laboratory checks are also conducted. Half core samples are retained on site. Samples were assayed at the SGS Laboratory in Mwanza, Tanzania, by 50g gold fire assay. Samples are also submitted to ALS Chemex, Mwanza, from where a < 75µm plit of the pulverized material is sent to ALS Chemex in Johannesburg for analyses by fire assay and ICP-AES. Except for the statements of historical fact contained herein, the information presented in this news release constitutes "forward-looking statements" as such term is used in applicable United States and Canadian laws. These statements relate to analyses and other information that are based on forecasts of future results, estimates of amounts not yet determinable and assumptions of management. Any statements that express or involve discussions with respect to predictions, expectations, beliefs, plans, projections, objectives, assumptions or future events or performance (often, but not always, using words or phrases such as "expects" or "does not expect", "is expected", "anticipates" or "does not anticipate", "plans, "estimates" or "intends", or stating that certain actions, events or results "may", "could", "would", "might" or "will" be taken, occur or be achieved) are not statements of historical fact and should be viewed as "forward-looking statements". Such forward looking statements involve known and unknown risks, uncertainties and other factors which may cause the actual results, performance or achievements of the Company to be materially different from any future results, performance or achievements expressed or implied by such forward-looking statements. Such risks and other factors include, among others, the actual results of exploration activities, the availability of capital to fund programs and the resulting dilution caused by the raising of capital through the sale of shares, accidents, labour disputes and other risks of the mining industry including, without limitation, those associated with the environment, delays in obtaining governmental approvals, permits or financing or in the completion of development or construction activities, title disputes or claims limitations on insurance coverage. Although the Company has attempted to identify important factors that could cause actual actions, events or results to differ materially from those described in forward-looking statements, there may be other factors that cause actions, events or results not to be as anticipated, estimated or intended.